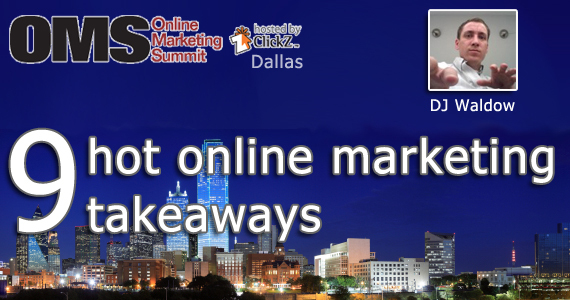 I attended and spoke at the Online Marketing Summit (OMS) in Dallas. Aaron Kahlow and his team put on a multi-city tour every summer spending a day educating marketers about email marketing, SEO, social media, website optimization, and other hot topics in the world of online marketing. Here are 9 hot takeaways from OMS Dallas! Many folks are still struggling to understand how social media is different for B2B vs. B2C. While there are certainly nuances of speaking with consumers vs. other business, the methods are the same for both. Social media is about being there before the sale, building credibility, and earning trust. 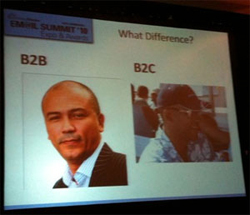 I use this slide on the right of my colleague Dela Quist when explaining the difference (Note: I snapped this picture of a slide in Dela’s presentation during the Marketing Sherpa Summit in 2010). Website secret #1: Communicate your message in less than 5 seconds. Jeffrey Eisenberg, Parnter at Eisenberg Brothers & Associates, provided 21 “secrets” for website optimization. (As it turns out, they were somewhat secret as Mr. Eisenberg informed us he would not be sharing his slides!) This was one of them. This one, while maybe somewhat obvious, seems to be missed by many organizations. Take a look at a few websites, including your own. Literally, physically step back a few feet from your monitor. Can you tell what that company does? What action do they want you to take? Website secret #2: Execute rapidly. Another one of the 21 secrets Jeffrey Eisenberg shared with attendees was to execute rapidly. Part of any good website or blog (often one in the same) is the ability to be flexible. Information is flowing at a faster rate then ever before. Companies who can add/change content on their site quickly win. If you have a process that requires 17 steps to get new content approved and posted, you’re likely going to be too late. Create a “Link to Us” Page: Make it easy for fans to link to you and be sure the code you provide is optimized for search. This tip was provided by Ray “Catfish” Comstock, Director of SEO at BusinessOnline. One of the keys to SEO is inbound links. One of the challenges, however, is ensuring that when folks link to you they are using the keywords that you want. One way to helpyour own cause is to provide easy-to-use widgets and code snippets on your site. Ask folks who are linking to you to use them. 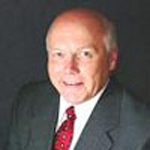 Use link building to show ROI in Social Media: While not all that straightforward to measure, Ray “Catfish” Comstock, Director of SEO at BusinessOnline, suggested that your social media efforts (Tweet, Facebook post, LinkedIn Answer, etc) can ultimately lead to link juice. In other words, someone reads something you post to your social network. It gets picked up by another person who ultimately writes a complimentary blog post about your and/or your organization and links back to your site. As mentioned above, this one is a bit tricky to measure, yet an important one. While somewhat of a manual process, I believe it’s important to tie back a positive, link-filled blog post to your social media efforts. Engage customers at an intuitive, emotional level: Patrick Bultema, CEO of CodeBaby, was the lunch keynote who provided this tip. Many buying decisions are made on emotion. This is especially true for lower cost, impulsive purchases; however, I’d argue that some folks drop big money based on emotion as well. If you believe that this is true, think about ways to appeal to consumers at the personal, emotional level. Most successful marketers serve vs. sell: Joel Book of ExactTarget talked about how email marketing tied into social media, mobile, offline, and other channels. This is something that we preach often at Blue Sky Factory – “Be there before the sale.” The basic idea is that before you try and sell your product or service (your “stuff”) to a prospect, engage in a conversation – provide advice, coaching, insights, etc. The sale will come once a relationship forms and trust is earned. Content production is a culture: Sean Jackson, CEO of Ecordia, was on the closing panel and talked a lot about content creation. His view was that all of these social media channels – Twitter, Facebook, email marketing, etc – will not serve you well if your organization does not have a culture of content production. Social media is just the vehicle to communicate this content. Not sure I could have said it better! Look to the adult entertainment industry if you want to learn how to do online marketing correctly. This statement by Sean Jackson, CEO of Ecordia, certainly woke folks up at the end of the day. Do you have a question for DJ or would you like to add a takeaway? Hey DJ…great summary and takeaways. We struggle with takeaway #2 and continually work on crafting our message. Marketing Experiments sums this up very well. They say you landing pages (including the home page of your website) should answer these three questions. Thanks for the warp up. BTW…when and where is the next event you are speaking at? Thanks for your comments. I’m actually in Chicago now at the eduWEB Conference. Speaking in the AM! You are welcome for the “warp” up – kinda reminds me of Star Trek. Ha ha.